Here is the list of the hotels near Villevallier. Book your hotel near Villevallier today, Thursday 09 May for the best price, reservation and cancellation free of charge thanks to our partner Booking.com, leader in on-line hotels reservation. Below here is the list the 50 closest hotels of Villevallier, sortable according your criteria. You will find the position of these accommodations on the Villevallier hotels map. Offering a traditional-style restaurant, Hotel Le Saint Julien is located in Saint Julien du Sault, a 10-minute walk from the river Yonne. The hotel offers en suite rooms, a bar and a small terrace. Free Wi-Fi access is available. Rooms here will provide you with a flat-screen TV. The bathrooms are fitted with a shower. Ironing facilities are available upon request. A buffet breakfast is available every morning and includes fruit juices, French pastries and jam. Guests can also request a late meal, available upon request. An array of activities can be enjoyed on site or in the surroundings, including cycling, hiking and fishing. The property offers free parking. 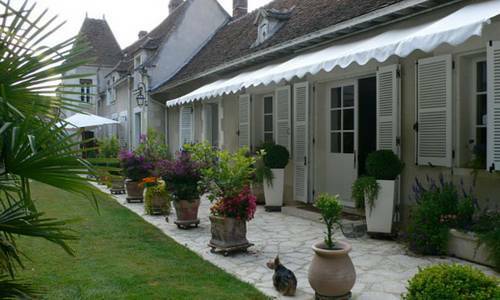 Hotel Particulier La Gobine is set in an 18th century building and is located in Joigny. The property is 25 km from Auxerre and 26 km from Sens. Free WiFi is provided. All rooms come with air conditioning. The suite features a living room, park views and a private bathroom equipped with a spa bath, free toiletries and a hairdryer. The deluxe king room has a bathroom with a walk-in shower A continental breakfast is served every morning in the dining room of the property or in the park. Ancy-le-Franc Chateau is 80 km from Hotel Particulier La Gobine, 33 km from Sain-Etienne de Sens Cathedral and 20 km from a golf course. The Bourgogne Wine Route and the vineyards in Chablis, Irancy and Coulange can be found less than 1-hour drive away. A free public car park is available on site. Joigny Appartement is a self-catering accommodation located in Joigny, 1 km from Saint-André Church and from Maison du Bailli. This one-bedroom apartment offers a terrace, a view of the garden and a large corner sofa. The apartment will provide you with a flat-screen TV with satellite channels and a DVD player. Featuring a shower, the private bathroom also comes with a hairdryer and free toiletries. Bed linen and towels are supplied for free. There is an equipped kitchen with a microwave and oven. At Joigny Appartement you will find barbecue facilities. After lunch, you can use free Wi-Fi access. It is 1 km from the train station and 26.9 km from the city of Auxerre. The property offers free parking. Located in Saint-Romain-le-Preux in the Burgundy region, Comme un air de vacances features a garden. The accommodation has free WiFi. The provided holiday home is equipped with 3 bedrooms, a living room, a kitchen, a dining area, and 1 bathroom with a bath. A flat-screen TV and DVD player are featured. The holiday home offers a barbecue. A terrace can be found at the property, along with a shared lounge. Auxerre is 37 km from Comme un air de vacances, while Sens is 46 km away. Situated in Villefranche-Saint-Phal, La grange aux Grenouilles features air-conditioned accommodation with a terrace and free WiFi. The holiday home has garden views and is 42 km from Auxerre. The provided holiday home is equipped with 2 bedrooms, a living room, a kitchen, a dining area and 1 bathroom with a hair dryer. A flat-screen TV is available. The holiday home offers a barbecue. Guests at La grange aux Grenouilles can enjoy hiking nearby, or make the most of the garden. Montargis is 34 km from the accommodation. Offering a barbecue and sun terrace, Les Bains Bed & Breakfast is situated in Cheny, 18 km from Auxerre. Free WiFi is featured and free private parking is available on site. Guests can relax in the seating area after a busy day. The room also includes a private bathroom and extras include bathrobes, free toiletries and a hairdryer. You can play tennis at this bed and breakfast, and free use of bicycles is available. Sens is 33 km from Les Bains, while Chablis is 25 km away. Located 8 km from Clairis Golf Club, the Grand Hotel de l'étoile is set in a 19th-century building with a flowery terrace. A buffet breakfast is prepared every morning and free Wi-Fi access is provided. Decorated in a traditional style, the guest rooms all have a TV and a wardrobe. Each room has an en suite bathroom that is equipped with a hairdryer. Non-smoking rooms are available on request. Breakfast can be delivered to your room at this hotel. You can also order a drink while relaxing on the terrace. There are restaurants located opposite this hotel. With free private parking on site, the hotel is only 3 km from the A19 and A6 motorways. Montargis Train Station is 30 km away. Le Relais offers rooms in Courtenay. This 2-star hotel offers free WiFi. The restaurant serves Local cuisine. All guest rooms in the hotel are equipped with a TV with satellite channels. All rooms are fitted with a private bathroom. The rooms include a wardrobe. Sens is 29 km from Le Relais, while Montargis is 31 km away. With garden views, Camping Les Platanes has accommodation with a kitchenette situated in Charny. Complimentary WiFi is offered. There is also a microwave, fridge and a coffee machine. Auxerre is 47 km from the camping, while Montargis is 35 km from the property. With free Wi-Fi, this 17th-century former post house is located in the town centre of Charny. It features a restaurant with an original fireplace and a bar with a shaded terrace in the garden. The soundproofed guest rooms are equipped with a flat-screen TV and each features a view. All rooms have a private bathroom including amenities. The restaurant at Le Cheval Blanc serves gastronomic cuisine and has a rustic décor. Every morning, a continental breakfast can be taken in the guest room. Hotel Restaurant Le Cheval Blanc is located opposite the indoor-market, which sells local produce every Sunday morning. With free private parking on site, this hotel is accessible via the A6 motorway. The city of Montargis is 35 km away. Puits d'Athie guest house is located in the picturesque village of Appoigny, with Saint Pierre Collegial. It offers chic modern rooms with views over the lush, flowery garden. Each room and suite has stylish decor and some have exposed wooden beams. Each has a spacious bathroom and the deluxe suite features a spa bath. A continental breakfast is served daily in the dining area or on the terrace at the Chambres d'hôtes du Puits d'Athie. Guests can use the free Wi-Fi access throughout the hotel. Free private parking is provided. Activities in the nearby area include horse riding and fishing. The guest house is 10 km from Auxerre and Migenne Train Station. Surrounded by gardens and a vineyard, this former chateau dates from the 19th century and is 12 km from Auxerre. It offers B&B rooms with en suite and self-catering houses with free Wi-Fi access. The guest rooms are situated in the chateau and feature antique-style furniture, as well as wooden floors or old-fashioned tiles. Independent houses with fully equipped kitchens are also available. A traditional breakfast is offered every morning at Château Le Barreau. In the summer, guests can eat on the shaded terrace which has views of the garden and vineyards. Popular activities in the area include parachuting, horse riding and ice skating. Tree-climbing activities are possible at Accrobranche d’Auxerre, 10 km away. Château Le Barreau is 10 km from Laroche Migennes Train Station and the A6 motorway. Free private parking is possible on site and Chablis is 25 km away. Situated in Hauterive, Le Manoir de Hauterive offers free WiFi. Every room comes with a terrace with garden views. All guest rooms in the guest house are fitted with a coffee machine. Rooms are complete with a private bathroom equipped with a bath, while selected rooms include a seating area. All units will provide guests with a wardrobe and a kettle. A continental breakfast is served every morning at the property. Auxerre is 16 km from Le Manoir de Hauterive, while Sens is 48 km away. Ideally located in Auxerre, near the motorway, Hôtel Le Pressoir - Auxerre Appoigny offers an on-site restaurant, free Wi-Fi access and free private parking on site. All rooms are spacious and feature a flat-screen TV with satellite channels. They are complete with a private bathroom. The restaurant serves traditional cuisine, reservation is required on the weekend and certain bank holidays. A buffet breakfast is also available each morning at Hôtel Le Pressoir - Auxerre Appoigny. Guests can visit the Chablis and Bailly wine cellars as well as several historical monuments in Auxerre. This Kyriad hotel is 1 km from the A6 motorway and 7 km from Auxerre. It has free Wi-Fi throughout, 24-hour reception, a restaurant and a bar. A buffet breakfast is also available at an additional cost. The guest rooms at Kyriad Auxerre Appoigny feature a flat-screen TV, a wardrobe, and individual heating. They also have wooden floors and en suite facilities with a shower and toilet, and some rooms are air-conditioned. The restaurant serves traditional French cuisine and regional specialties. The communal lounge features a flat-screen TV. Situated next to the A6 motorway, in the heart of the Yonne Valley, the hotel welcomes you 10 minutes from the city centre and 20 minutes from Chablis. Mercure Auxerre features 77 ground-level rooms fitted with modern comforts, a lovely terrace and a swimming pool. The rooms offer a view of the superb 4-hectare park. The restaurant, Le Chaumois, serves traditional and tasty Burgundy cuisine. There are 6 adjustable conference rooms for up to 300 people. The conference rooms have a total area of 335m². Boasting a seasonal outdoor swimming pool and barbecue facilities, Tourterelle, à proximité de Auxerre et Chablis offers accommodation in Hauterive with free WiFi and garden views. This holiday home has a private pool and a garden. This holiday home comes with a seating area, a kitchen with an oven, and a flat-screen TV. The holiday home offers a terrace. Hiking can be enjoyed nearby. Auxerre is 18 km from à proximité, while Sens is 49 km from the property. Offering an outdoor pool and a terrace in its garden, Domaine de Beauvoir is located in Beauvoir. Set in a former barn originally built more than 2 centuries ago, the guest house is decorated in a traditional style. With views of the garden, the rooms here will provide you with a private bathroom. Free Wi-Fi access is available throughout. A continental breakfast is available daily. Guests can also go to the local market on Saturday. Additional facilities at Domaine de Beauvoir are a sauna, a shared lounge and a games room. An array of activities can be enjoyed on site or in the surroundings, including cycling, billiards and table tennis. The property offers free parking. The Quick Palace is a budget hotel, located in Bourgogne, just a 10-minute drive from Auxerre – Branches Airport. It offers comfortable rooms featuring a flat-screen TV with Satellite channels. The soundproofed guest rooms at Quick Palace Auxerre feature a work desk and are equipped with free Wi-Fi access. Each guest room has a private bathroom with bathroom amenities. Guests can choose to take advantage of the continental breakfast buffet, served every morning in the breakfast room. Snacks and drinks vending machines are also available. For guests arriving by car, the Quick Palace is accessible by the A6 motorway. There are shops nearby and it is only a 5-minute walk to the CyberGlace ice rink. Hotel Campanile Auxerre - Monéteau offers modern accommodation with free WiFi access throughout. It is located 6 km from the centre of Auxerre and has a 24-hour reception desk. Each of the guest rooms have a flat-screen TV, telephone and air conditioning. They are all decorated in neutral colours and the private bathrooms include a bath or shower. Situated 15 km from the train station and 7 km from Branches Airport, the hotel is also easily accessible from the A6 motorway exit signposted Joigny-Migennes. Premiere Classe Auxerre hotel is easily accessible by the A6 motorway and ideally located for visiting the Burgundy region. It offers budget accommodation with free Wi-Fi internet access. Guest rooms have a simple décor and feature a private bathroom. All rooms are equipped with a television and a work desk. The Premiere Classe Auxerre provides a buffet breakfast every morning, which is half-price for children under 10 years old. There are also many restaurants within walking distance. With free private parking on site, the hotel is just 5 km from Auxerre City Centre. Featuring free WiFi, B&B Hôtel Auxerre Bourgogne offers pet-friendly accommodation in Monéteau, 6 km from Auxerre. Free private parking is available on site. Rooms have a flat-screen TV. Rooms include a private bathroom. Avallon is 49 km from B&B Hôtel Auxerre Bourgogne, while Sens is 44 km away. Hotel Monéteau Preferred hotel ! Hôtel Cerise Auxerre is located 10 km from Auxerrexpo Exhibition Centre. It is a 10-minute drive from the city centre of Auxerre. Free WiFi access is provided throughout the hotel and private parking is free. All rooms include a flat-screen TV with satellite channels and have soundproofing. Each has a private bathroom fitted with a shower. A buffet breakfast is prepared every morning. You can dine in one of the hotel's nearby partner restaurants or order a meal basket on-site. The hotel has a 24-hour reception. Vending machines selling drinks and snacks are available. Auxerre Train Station is a 5-minute drive away. Featuring free WiFi, B&B Hôtel Auxerre Monéteau offers pet-friendly accommodation in Monéteau, 6 km from Auxerre. Free private parking is available on site. Every room includes a flat-screen TV with cable channels. Each room is fitted with a private bathroom equipped with a shower. Avallon is 49 km from B&B Hôtel Auxerre Monéteau, while Sens is 44 km away. L'Enchantée is offering accommodation in Triguères. Among the various facilities are a seasonal outdoor swimming pool, a tennis court, as well as barbecue facilities. Rooms come with a terrace with garden views. At the guest house, rooms are fitted with a wardrobe. The rooms are equipped with a flat-screen TV, and some rooms also feature pool view. The units are fitted with a seating area. A continental breakfast is served each morning at the property. L'Enchantée offers a children's playground. Guests can take part in various activities in the surroundings, including fishing and hiking. Sens is 47 km from the accommodation. This charming dwelling set on the edge of a beautiful forest welcomes you in Burgundy and offers a warm atmosphere blending quietness and modern comfort. All guest rooms at the Petit Manoir des Bruyères have view of the forest or the park and boast traditional setting, with period furniture and historic décor, which harmoniously blends with contemporary amenities like satellite television. The nearby area offers many leisure activities, like horse riding, fishing, swimming pool or golf course. Set in Saint-Georges-sur-Baulche in the Burgundy region, Holiday home St Georges sur Baulche L-760 is a 3-star property boasting free WiFi. Guests staying at this holiday home have access to a fully equipped kitchen. The holiday home includes a living room with a TV and a DVD player. Auxerre is 5 km from the holiday home, while Chablis is 25 km away. Located in a quiet and leafy setting in Auxerre, the ibis Styles Auxerre Nord offers guests traditional cuisine, an outdoor seasonal swimming pool and 2 tennis courts. The ibis Styles Auxerre Nord restaurant with its large terrace offers traditional cuisine with a Burgundy flavour. Dinner and bed and breakfast options are available as well. Rooms are comfortable and well equipped with air conditioning, satellite TV with French sports channels and free Wi-Fi access. The ibis Styles Auxerre Nord also provides a 24-hour front desk with a night porter. It also has an outdoor car park and a secure garage. ibis Styles Auxerre Nord is 5 minutes from exit 19 of the A6 motorway and 23 km from Chablis. Bed and Breakfast Monéteau Preferred hotel ! Situated in Monéteau, 4 km from Auxerre, Le Domaine des Archies features free WiFi access and free private parking. Guests can enjoy the heated outdoor pool and the garden, which offers a relaxation area and a boules court. The double room comes with a king size bed, a flat-screen TV and a private bathroom fitted with a shower. Avallon is 46 km from Le Domaine des Archies, while Sens is 47 km from the property. Paris is 170 km away. Below here is the hotels map of Villevallier. Names and details of Villevallier hotels can be shown on the map clicking on the prices icons.